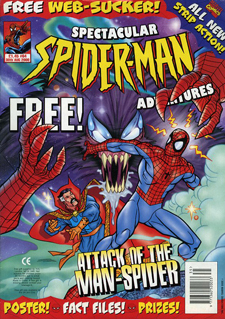 The best fun I had at Marvel UK/Panini (outside of the local pub anyway) was writing originated stories for Spectacular Spider-Man Adventures. I was the launch editor for the comic way back in 1996 and started writing the main 11 page strip from 1998 through to 2001. I was lucky enough to work with some of my favourite British artists John Ross, Anthony Williams and Richard Elson on the title and it was great to see the comic recently pass the 150 issue mark.